BOONE - Iowa’s pheasant hunters can expect to find more birds this fall when they head to the fields, predict state wildlife experts. That forecast is based on the recently completed statewide population survey of pheasants, quail, partridge, cottontail rabbits and jackrabbits. Iowa’s pheasant population increased in every nine county region except northwest where it was similar to last year. The survey counted a state average of 21 birds per 30 mile route which translates to a statewide harvest estimate of 250,000 to 300,000 roosters this fall. The August roadside survey is tool used by the Iowa Department of Natural Resources (DNR) to physically record the number of upland game seen while driving the survey routes. It’s a product of 218 30-mile routes across that state that are conducted Aug. 1-15 beginning at sunrise. The survey has used the same routes since 1962. “We weren’t sure what to expect from the survey this year because the spring weather was all over the board and it likely impacted some nesting success,” said Todd Bogenschutz, upland wildlife research biologist for the Iowa DNR. April started cold with 10-20 inches of snow across northern Iowa and then switched to warm and dry by the end of May. “The take home message is, if you had good hunting last year, you can expect similar hunting or better hunting across most of the state this year,” he said. The 2018 count was an increase over the 15 birds per route in 2017. However, Bogenschutz said dry conditions in 2017 likely did not accurately reflect the pheasant population and when adjusted for the lack of dew the population would be similar, but still slightly lower than 2018. Another positive for hunters is the quail and cottontail rabbit populations, both at present day highs. “Anyone who has ever had an interest in quail hunting or hasn’t hunted quail recently – this would be a good fall to go,” Bogenschutz said. Iowa’s quail range is across the southern third of the state. Rabbits are abundant in all parts of Iowa with the highest populations in southern and east central regions. Partridge population is similar to 2017 with the highest population in central and northern Iowa. The lone exception is jackrabbits which have seen its numbers fall likely due to a landscape that shifted from producing small grains and fields of short grasses to larger fields of corn and soybeans. 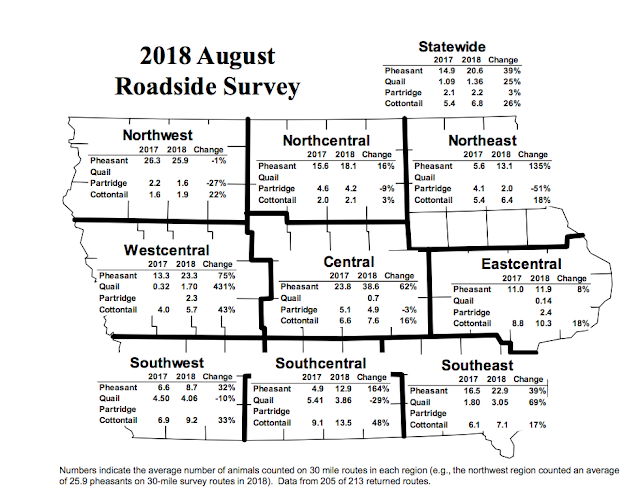 The August roadside survey and game distribution maps are available online at www.iowadnr.gov/pheasantsurvey.